Puerto Penasco Mexico Focus Eye Center Charity from Malcolm Judd on Vimeo. 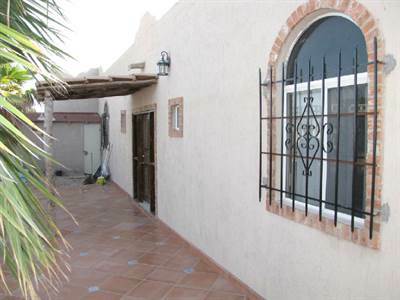 In Town, Puerto Penasco/Rocky Point - Beautiful 250 M2 custom home in the heart of town. 3 bedroom 3 bath. Large one car garage and space for RV parking Fenced yard with gate. French doors from master bedroom lead to tiled back patio with private garden. Tiled front porch leads to decorative front door and inlayed tile at entrance. Located between Ignacio Comonfort and Miguel Hidalgo Ave on 40 Oriente. Ave. Perfect starter home or home for retirees. We market on the following web services. International House Hunters from TLC comes to Puerto Penasco, Rocky Point, Mexico. The popular international television series International House Hunters shows you the investment opportunities just south of the border in Rocky Point, Puerto Penasco, Mexico. Learn more about the investment opportunity available for investors, retirees and individuals in Puerto Penasco Mexico. Contact Kyle Wood at Realty Executives Rocky Point for more information at 480-297-8079. We have recently announced a dramatic price reduction in a luxury ocean front condominium in Puerto Penasco, Mexico at Las Palomas. With a 110,000 dollar price reduction, the 3 bedroom unit is now priced at $289,000. Sellers are offering owner financing. Looking for a home on Sandy Beach in Puerto Peasnco, Rocky Point, Mexico. Cabrillo 1207 at Las Palomas Golf Resort, Rocky Point, Mexico is a 3 Bedroom 3 Bath condominium with views of the Sea of Cortez on the wrap around patio. contact Kyle Wood at Realty Executives Rocky Point for more information at 480-297-8079. So you just bought that luxury ocean front property in Rocky Point, Mexico? And now you need to furnish it that home or condo. There are several options available to buyers of Puerto Penasco, Rocky Point Real Estate. You could have a mover transport your furniture to Rocky Point or there are some really nice furniture stores locally from which to buy. Some even offer made to order furniture. There are two furniture movers I recommend to my clients. Both movers will pack and load your furniture, transport it to Rocky Point, and deliver and set it up. They also handle the customs paperwork that is required by Mexican importation law. We look forward to serving your Mexico relocation needs. 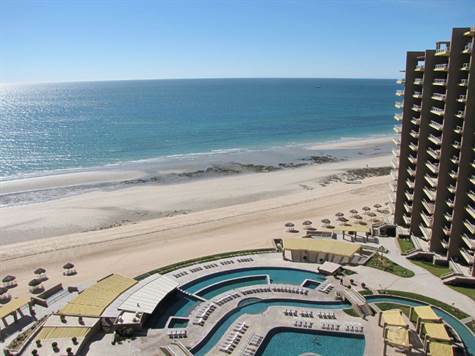 In Town, Puerto Penasco/Rocky Point - Announcing a price reduction on 008 Manzana 485 Region Terecera, a 250 sq. m., 3 bath, 3 bdrm single story. Now $90,000 - Reduced. How to Finance your Dream Property in Mexico. A Guaranty Trust is used in transactions involving seller financing (seller carry back) in Mexico. The guaranty trust is a formal document that includes the terms and conditions of the seller carry back and the parties involved in the transaction. It indicates the name of the seller and his/her beneficiaries, and indicates the name of the buyer. The seller will remain a party to the document as the lien holder. The Guaranty Trust and the Lien will be registered in the public registry. When the buyer pays off the remaining balance of the loan, the seller and lien will be removed from the Guaranty Trust. The Guaranty Trust then becomes a regular trust. In situations where the buyer defaults on the seller financing there are 2 options for the seller to consider when foreclosing on the property: 1) Auction, 2) Back to Seller. 1)	In many parts of Mexico an auction process is used in seller financing transactions to remove buyer from property and make the seller whole. The process for auction is as follows: Seller obtains a notarized letter stating that buyer is in default. Notario drafts letter, this letter is sent to the Bank Trust Administrator. The bank trust administrator is technically the owner of the property, as such they will initiate the auction process. A notice of auction must be placed in a national and local paper, stating the date of the auction, lien amount, and names of parties involved. Auction will take place in jurisdiction of property. If auction results in an amount greater than the lien amount the difference will go to the buyer, seller will receive the amount remaining on the lien. Banks in the State of Sonora do not conduct many auctions compared to other parts of Mexico. 2)	The second option available to a seller to remove a buyer who has defaulted on seller financed property is very simple. Seller will provide a notification to Notario that buyer has defaulted on loan. The Notario will draft letter stating buyer has defaulted on loan, notarized letter will be sent to bank administrator. Bank administrator will make changes in to the Guarantee Trust that seller has taken possession on property. The seller should also instruct the Notario to submit changes to the public registry. Get Ready for the Las Palomas Rocky Point, Mexico Golf Open Nov 2 - Nov 4, 2012 for 36 holes of golf. Practice Round begins at 7AM on Friday the 2nd. Registry at ProShop starts at 9AM. Looking to play golf while on vacation in Puerto Penasco, Mexico. There's no better place to stay and play golf all in one location. Las Palomas Sea Side Golf Resort is the place to be and play golf. This 18 hole, par 72 championship golf course was designed by golf course architects Forrest Richardson and Arthur Jack Snyder, laid out within the sand dunes of Sandy Beach in Rocky Point, Puerto Penasco, Mexico. Open to Las Palomas Resort owners as well as the public, golfers in Puerto Penasco, can play for as low as 30 dollars for 9 holes with golf cart included. Not up to play 9 or 18 holes, then take in a swing or two at there driving range. I've included the most current fee schedule for the links below. For more information on purchasing a condominium at Las Palomas Resort in Puerto Penasco, Mexico visit our Condominiums for Sale in at Las Palomas Rocky Point Web Page. Call Kyle Wood at Realty Executives Rocky Point for more information 480-297-8079. Las Palomas, Sandy Beach - Beautiful Ocean view retreat with a POPULAR 3H floorplan, features an end wrap balcony. Fully furnished!! Fantastic views from dining, and living rooms, plus master bedroom. A second bedroom has a separate entrance with own full bathroom and mini-bar. Picture yourself on the extra large balcony watching the dolphins in the Sea of Cortez. Wide open kitchen features granite snackbar, countertops, and tons of storage in the European style cabinetry. Full sized GE appliances with R/O filtered water, make working in the kitchen a breeze. Spacious living area with internet access and cable TV included in the HOAs. The bedrooms are large enough for king sized beds. You may even see a few dolphins from your patio. Las Palomas is offer some great rental reservation deals for this 2012 Labor Day weekend. We expect to have 100% occupancy so reserve your beach front condo today. Las Palomas has all the amenities you need to have a wonderful and relaxing weekend. Enjoy a game of golf while the kids are at the child day care center. Or spend the day relaxing at one of the many pools with swim up pool bar and food service directly to your beach chair with your own palapa. Here's an opportunity you can turned down. This Las Conchas Beachfront home has eveything you need to relax on the beach of Puerto Penasco. This 2 bedroom 2 Bath 3 car garage is your vacation getaway. The custom home has walk out patio from the master bedroom with sweeping views of the beach. Custom kitchen, cathedral ceilings, block fence with gate, firelplace. There has never been a better opportunity than now to purchase ocean front property in Mexico. To make your purchase even easier, sellers are filling to offer seller financing. What are you waiting for. Call Kyle Wood today at Realty Executives Rocky Point for more information at 480-297-8079. Visit our Rocky Point Real Estate for sale website for additional photos and information.